It wouldn’t be February without a mustache contest would it? A word to the wise folks— the next time you accuse your friend of being a douchebag because he’s growing a mustache, just remember, he may also be participating in a contest. 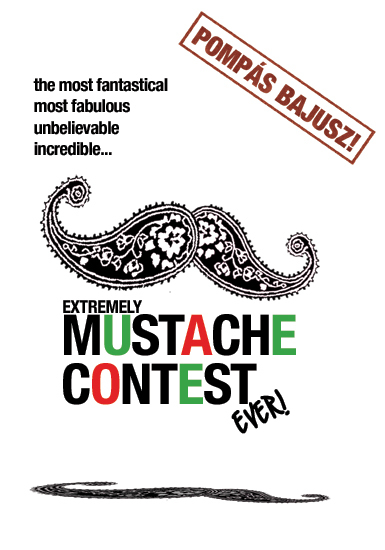 Grow a fabulous mustache in two-and-a-half months and win amazing prizes! Including a Grand Prize trip for two to Budapest, Hungary. GRAND PRIZE: Roundtrip for two to Budapest, Hungary! Be the envy of everyone! Win fabulous prizes! Sign up on February 1st and receive your Extremely Hungary Mustache Enthusiast membership card. The first 10 people to sign up will receive a FREE copy of Gaborabilia, an Illustrated Celebration of the Fabulous, Legendary Gabor Sisters.